BMW has officially put a new ‘iPerformance’ 7 Series on sale in the UK, which takes fuel-saving tech from the i3 and i8 models and filters them into the flagship saloon. 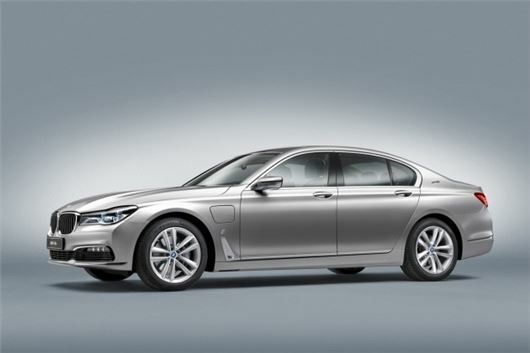 The 740e will start from £68,330, while the long wheelbase version will be priced from £74,880. Both are available to order now. The plug-in hybrid 740e is powered by a 2.0-litre four-cylinder turbo petrol engine, mated to an electric motor. The combined output of the two is 326PS, making the 740e capable of going up to 29 miles on electric power alone – or hitting 62mph in just 5.6 seconds when electric and petrol motors combine. BMW's xDrive four-wheel drive is fitted as standard. Amazingly, CO2 emissions for this huge saloon are rated at 49g/km, with official fuel consumption at 134.5mpg. There’s a long-wheelbase version too, called 740Le, with 56g/km of CO2 and a claimed 113.0mpg. All iPerformance models are marked out by eDrive badges on the C-pillars, ‘i’ badging on the wings and, if specified as a no-cost option, a blue kidney grille and wheel hubs. The 740e joins the 225xe Active Tourer MPV, the 330e saloon and the X5 xDrive40e in the iPerformance range, all of which are already on sale.